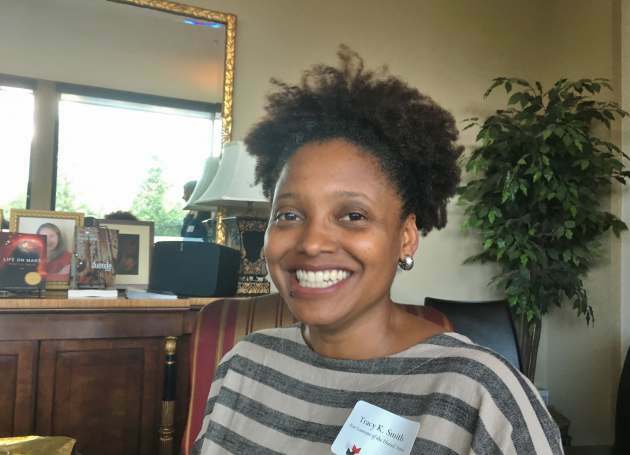 Tracy K. Smith (above, photo by Rohan Preston), the incoming Poet Laureate of the United States (PLOTUS), buzzed through the Twin Cities Tuesday on her way to Bemidji. Smith, who teaches at Princeton, read poems, took questions and signed books as she regaled a crowd of ardent supporters of Graywolf Press, publisher of all her poetry books, including her third collection, "Life on Mars," which won the 2012 Pulitzer Prize for Poetry. At the literary salon, held in a Graywolf board member’s home overlooking the Minneapolis Sculpture Garden, Smith thanked Graywolf publisher Fiona McCrae and editor Jeff Shotts, longtime supporters who have championed her work. Smith shared two new poems from her forthcoming fourth collection, “Wade in the Water,” which will be published by Graywolf in 2018. She also spoke about an initiative that she will take up in September when she assumes her office as PLOTUS at the Library of Congress. She will be traveling to rural areas of the country to spotlight and cultivate poetry. "One of the women greeted me.